"The skewer is one of most perfect expressions of Basque cuisine. Ambassadors of the San Sebastian version of Rotisserie are what they are in the restaurant Estay on 46 Hermosilla street. 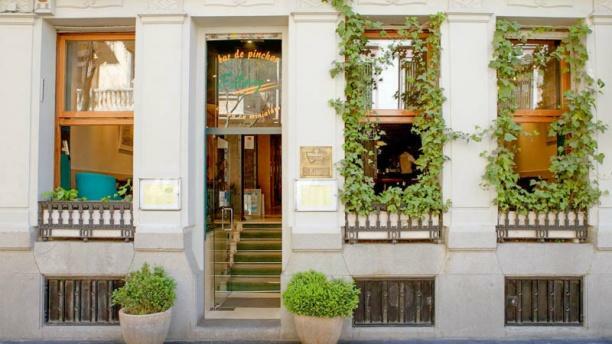 This charming place has two floors with different areas to eat and enjoy tapas with greater and lesser degrees of formality, and captures the tradition of the best taverns, in one of the most emblematic streets of the Salamanca district. The skewer, the haiku of Basque gastronomy, is presented here in its various forms: canapes, tarts, ramekins or in its most creative and cutting-edge metamorphosis. You can pair it with fine wines from their wine cellar as tradition dictates. They say it is almost impossible to make a mistake in San Sebastian at mealtime. And you can't go wrong if you choose this San Sebastian embassy. make a safe choice and book now in Estay. Avant-garde and tradition. Informality and distinction. Estay makes it easy, as in the magic of Basque cuisine, to combine opposites." Great food, ambience, and I will definitely go back ONLY yo the bar area. We had bad service: we seemed to be an inconvenience to the waiter who never smoked and could care less about service. Too bad because we love the restaurant. In Madrid be prepared to have a sit down dinner no sooner than 8pm and we reserved! Service was professional, tapas were exquisite! Value for the money inluding wines was fantastic! I would highly recommend this restaurant. Large selection of tapas. The tapas we had were very good. Service was quick and professional. Nice dining room and atmosphere. Absolutely delicious. Lived up to its reputation. Our first experience with this restaurant but certainly not our last. Tipical spanish food with quality one and well done. The service was very very good too (and patient). The bill was an great surprise for this quality of food and service.